Just did a deal on a new, red 2018 RLX Sport Hybrid from a dealer in Chicago. Made an offer I could not refuse, although I was definitely not ready to get rid of my 2007 RL....that car is still solid and in great shape......even at 133,000 miles. Looking forward to another 10+ years of Acura ownership.....can't wait! Congrats Dan. Enjoy your new ride and let us know once you've had some time behind the wheel. Welcome to the club of unicorns. May I ask how much you paid for it before TTL? I just may want to trade my '16 for an '18 or '19. Thanks!! Congrats! Let's see some pictures. Very different drivability. :-) You'll be getting used to some things, and it'll be interesting hearing what you say. Congratulations DanL07RL. This forum is awash with former RL owners who just love their Sport Hybrid RLX's - I hope you are equally satisfied. Have fun. Congrats! Please do share photos and give feedback between the RL and RLX when you can. Thanks! The car had been "put in service" by Acura in CA for promotional stuff last January, then "sold" to the dealer in Chicago with 358 miles on the odometer. It sat there until recently "Certified" and I paid $48,999. Last edited by DanL07RL; 09-05-2018 at 05:04 AM. That is a steal! If I did not have one already I would run and get that. I stopped by in person at Muller's Woodfield. They are pretty awesome and they definitely have some mojo going on with pre-owned inventory. Congrats and what a steal. Enjoy! Congrats Dan! I will be very interested to read your review too after some time with your RLX relative to your RL. I have 126k on my 2012 RL. Have only replaced the battery, tires (once), and front brake pads. Rock solid car, and I live in inside the DC beltway so driven in intense traffic. Still performs, rides, and drives like brand new (and zero rattles). My past 2006 RL is still on the road with 250k miles. My Acura service advisor bought it from me years ago. I saw it last week and it still looks new inside and out (he had the aging clear bra removed and amazing how well it protected the front end). Amazing how well engineered and put together these RL's were. Very evident costs were not an overriding engineering priority like most new cars. True Car shows mkt avg of $53.5k for a new RLX Hybrid in metro DC. I did request TrueCar pricing a few weeks ago. Radley Acura in Falls Church, Virginia came back with lowest price of $51K for choice of 2 identical in-stock brand new 2018 RLX Hybrids in Crystal Black Pearl with Seacoast leather. BTW, that Brilliant Red would be my 1st choice of color. Enjoy! My now current '17 SH Adv I bought last Oct for $51000 not looking as good of a deal as what is getting posted here. But then the '17 had a higher MSRP than the equivalent '18. Proof that Acura overpriced the car. I too feel a little blah after seeing some of the deals being had here recently. I knew I paid way too much for my RLX, but geez. I'll just continue to lick the wounds while I sit back and wait for the next round of changes/improvements. When I first found out about the KC2, they were still being held up and everybody said they mightn't ever get here. Finally, in October 2014, my little dealer in Woodbridge VA finally got one, single white car with a Seacoast interior. They said that was probably the only one they'd ever get, and until 2018 model year, they were right. I paid 63 for it, which sounds dumb, now. But I have to say, I still like the car and somehow have the feeling they were looking at people like me when they programmed it to hang out the tail in a corner. The biggest pain in the neck in the whole infotainment system but I'm sure by now none of you need to be persuaded of that. If I had one thing to change about the drivetrain or drivability, it'd be the delay that's inherent in this kind of hybrid system. The whole second it can take for the car in an emergency to start up the ICE, switch profiles, come on the cam and get going is...well...I won't say dangerous but you definitely have to take account of it. If I am passing a car on a country road, I'll always take the precaution of switching to sport mode first. I've driven the new Accord Hybrid and the Insight, and this kind of hybrid system is the way ahead. Serial hybrids eliminate the delay completely, and I would not be surprised if the 2020-2021 Legend incorporates some kind of serial hybrid using three electric motors and an ICE that usually only serves to charge the batteries. Last edited by George Knighton; 09-07-2018 at 08:55 AM. Proof that Acura overpriced the car. In their defense, the dollar/yen ratio was anticipated in 2012-2013 to have been very different from what it turned out to be. Because our cars are 100% Saiyama, the dealers have to "deal." For those that feel you paid too much for your car, I don't think you did. Anything under sticker is good. There isn't another car that delivers the features this car does at sticker or below. I think the current prices reflect the over all weak sedan market. And in the sedan market, it's Audi, BMW, Lexus, and MB. The automotive press loves the Germans. They have for years. The germans build good cars, but I think part of the price is the privilege of having their name plate on your car. The RLX SH just doesn't get any respect, the Rodney Dangerfield of cars. I really appreciate mine. I live in a Suburb North of OKC. I've seen two RLXs since last March. Try driving a block with out seeing a German or Lexus, another face in the crowd. The folks that have ridden in my car are amazed, and flabbergasted with the straight line performance. As far as the infotainment center. I've read reviews on some very high priced cars, close to six figures. Some of those cars have clunky infotainment systems. Not trying to excuse Acura, but apparently getting them right is damn difficult. For the price I can't think of a better sedan than the RLX SH. Dan; that RLX SH is hot! OK, I currently have a 2011 RDX FWD since 2014, and enjoy it for what it is. However, unless something wows me, definitely going to consider a slightly used RLX SHAWD Hybrid 2018 or up depending when I pull the plug. You people do nothing but praise this thing left and right. I go back and forth on the Entertainment thing. I don't have Apple car play now, and get by just fine it seems. For normal day to day driving, if I want to stream music, I just stream it. If I make or receive a phone call, it comes through. What more should you want from the info system? I don't plan on living in the car so 4G hotspot doesn't seem a big deal to me. My two cents. I am convinced this is the ugly duckling car that no one appreciates (except those who have it). Now that most manufacturers are allowing Apple to tell them what to do and how to do it, CarPlay is in more and more cars. This gives them a way out; namely, to save the purchaser a heap of money by selling them a car with a good screen and CarPlay, but without navigation and other infotainment features that are covered as well or better by iOS. I consider myself somewhat fortunate as I picked up my CPO 2015 RLX SH Elite (Advance) for $44K CDN (or around $33,500 USD at current exchange) last spring with only 22,000km (13,500 miles). I say 'somewhat fortunate' because if I were to trade it in now, I'd only get around $34,000 CAD for it if I'm lucky - so I've lost roughly $10,000 in depreciation in a year and a half. I appreciate that is significantly less its $72K CDN list price when new, and less than others have experienced on this forum, but it still stings. Higher end cars depreciate quickly and sadly there is no way around that I guess. Ha! Don't get me started on overpaying! Last edited by holografique; 09-11-2018 at 09:04 PM. Per Holografique: "and stick with something small sporty nimble for the weekend fun. If I do swap brands, it will prob be a TT somewhere down the road." I was thinking the same thing, an Audi TT just for a fun car, but then I am thinking why not the Acura RLX SH. I think a two year old CPO one sometime in 2020 (so a 2018 model) will be about the same price. I think I would like to have more room. I know, two totally different cars, but I guess it comes down to driving factor. Which one is fun to drive, and which one is more capable on a longer road trip in retirement. Have two years to think about it I guess. Sounds very familiar. That was basically my plan....until they threw me the offer I couldn't refuse! Dan, did you get the car for the $49,900 price that was listed, or even less? That does sound like a sweet deal then on a pretty much new RLX with an extra year of warranty thrown in. At that price, and it being a 2018 SH, I don't blame you. Great deal. Enjoy it! Yes, the deal was for $49,900. I'm now working to find an "optional" spare tire kit to add to the deal......but they are on back order. Yes, the price was very attractive, and two days before I did the deal, they added Certification....no brainer!! I still have the spare tire kit for my prior 2014 RLX Sport Hybrid. I can't imagine that the setup is much different for 2018 even with a different part number. LMK if interested! BTW this internet sales guy has been great!! Doubt this will be here long. They appear to not even know what they have. It isn't even listed as a hybrid. LOL . . . . . . I'd be all over it too if it weren't for a bathroom remodel which just dented the bank account. Initial thoughts: DRAMATICAALLY impressed with the smooth and aggressive application of power….even without the Sport mode!! VERY solid and refined....quiet....love it! Infotainment is OK IMHO....I don't need Car Play....car looks great especially in that color. And if I get into a wreck it will be because I'm looking at the very cool power distribution graphic. Also scored a deal on the Tier II extended warranty.....10 years/100,000 miles, bumper-to-bumper AND power train, for $1500!! Here's a pic of me picking it up with my crazy sales guy. 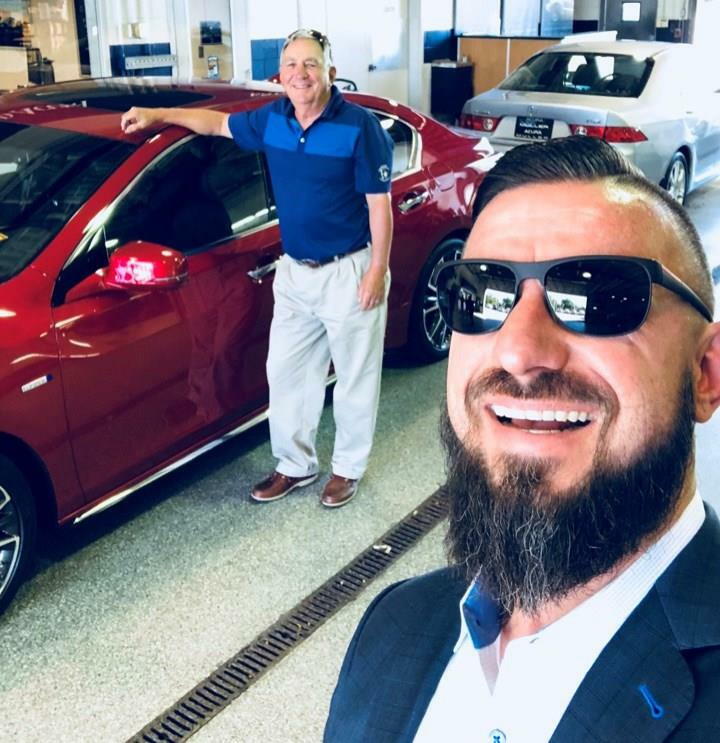 Dan you're styling and profiling with that gorgeous RLX!